From a satellite’s point of view, Lake Texoma resembles a rough-around-the-edges dragon. Last summer the dragon escaped the shoreline that held it captive for 64 years. But raging whitewater didn’t pour over Denison Dam, it was a creeping, relentless flow. Beginning in May the skies opened, the rains fell and the lake level slowly rose. “It began to rain around Memorial Day. That was the first holiday we lost,” said Jason Cottingame, General Manager of Grandpappy’s Marina. For people whose livelihoods depended on the lake, people who had been through a business-straining drought the year before, the daily dousing was a stomach churning irony. “You wake up in the morning, it would be raining again, and it would just make you sick,” Cottingame said. Lake Texoma’s normal depth is 617 feet above sea level. It eventually rose to 640 feet and nine inches. 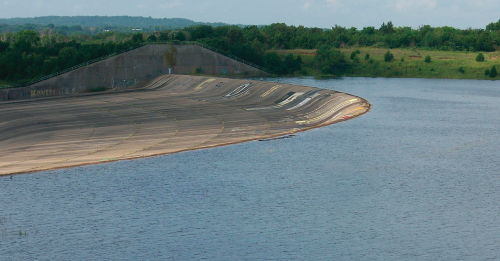 The Denison Dam’s spillway is at 640. “The water was almost 24 feet above normal,” said Army Corps of Engineers Lead Ranger Chris Lynch. Pompano’s Restaurant, The Clipper Bar and Sherman Power Sports were not as mobile. “Our entire lower level was underwater,” said Hayes. He pointed at what resembled a dirty bathtub ring, an indicator of where the water stopped short of the second floor of Highport’s offices. The marina’s financial loss was staggering. “Nine million in structural and road damage, a couple million in lost business,” the frustrated general manager said. 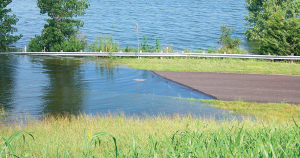 The rising water impacted the entire region. Depending on who is counting, losses amounted to anywhere from $400 million to $500 million. During the flood, a handful of hard-core boaters still wanted to check on their vessels. “We ran water taxis around 21 hours a day. I had someone who would pick people up and take them to their boats to check on them,” said Cottingame. Minutes before the water began to crest the spillway at Lake Texoma. Hayes did the same thing at Highport. “It was a tremendous team effort. It was wonderful; the clients supported us 100 percent,” he said. Even some of the smaller businesses on the lake refused to let the flood stop them. “When it hit, we could have told customers, ‘we can’t do it, the water’s too high, we’re sorry.’ Instead we rented a pontoon boat to get to their boats,” said Joshua Hulsey, owner of Yacht Docs, a boat detailing service. Customers weren’t the only concern. Employees were a concern as well. Even though their influx of cash had been cut off, Grandpappy’s, Highport, Yacht Docs, even a hard hit local restaurant did not issue pink slips. “I had employees relying on me for their livelihood, I was accruing additional bills, and I had my doubts about whether it was feasible to continue operations,” said Hulsey. A few minutes up the road at Da Happy Cajun it was the same. No boaters, no fishing guides, no weekend visitors meant hard times. “We had four months in the red, but we still kept our employees. You don’t let good people go,” said restaurant owner Terry Wall. The Walls refused to let the flood get the best of them. “We’re family owned and operated, so you cut corners. We’ve been in business for 40 years. You know how to tighten your belt up, and you do what you gotta’ do,” said Wall. But not every business lost money; at least one had more folks walking in the door than normal. The Dairy Mart, a burger joint, fed folks coming to check on their boats, folks who came to gawk, and folks who came to rebuild. 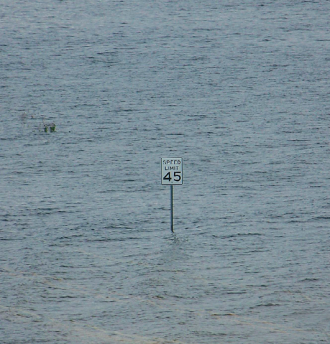 FM 1310, the main road into Thompson Heights off Highway 91 temporarily became part of the lake. Chatter around the lake that insurance payments were coming slowly, that companies were dragging their feet on paying, or that the flood was man-made because the dam wasn’t opened, elicited little response from anyone. Requests for insurance company names were politely denied. So swollen was the lake, that once the rain stopped, it took 110 days, more than three months, of open floodgates to get things back to normal. “We’ve gone years without opening them once,” the ranger said. Amidst that excitement, Lilta Sullivan summed up most people’s feelings pretty well with a quiet prayer she’s been sending up.